Cars 3 pays homage to NASCAR with four characters based on real-life stock car racing legends. Chris Cooper (American Beauty) voices Doc Hudson’s crew chief Smokey; team owner and NASCAR racing legend Junior Johnson lends his voice to Junior “Midnight” Moon; three-time Emmy® winner Margo Martindale (FX’sThe Americans) provides the voice of Louise “Barnstormer” Nash; and Isiah Whitlock Jr. (HBO’s The Wire) is the voice of River Scott. 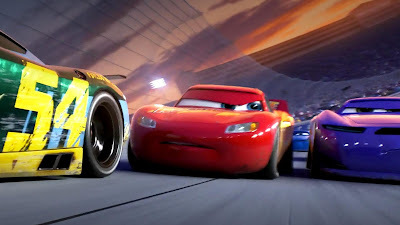 The film also features NASCAR drivers and the voices behind the sport, as well as a host of returning characters from Radiator Springs and the Cars racing world.